One of my last "Memories" articles was accompanied by a photo showing an ox-cart loaded with happy people on a Sunday afternoon at Harrisburg, Ga., in the early days of the last century. Harrisburg was significant at one time as being a station for the TAG (Tennessee, Alabama, and Georgia) Railroad which existed from approximately 1890 until 1971, serving as a main artery of transportation, both for passengers and freight. It ran between Chattanooga and Gadsden, Ala., along the foot of Pigeon Mountain. Until the railroad went through, this entire northwest corner of Georgia was very isolated and cut off from all major population centers and trade routes - and it is where my father was born, in 1884. 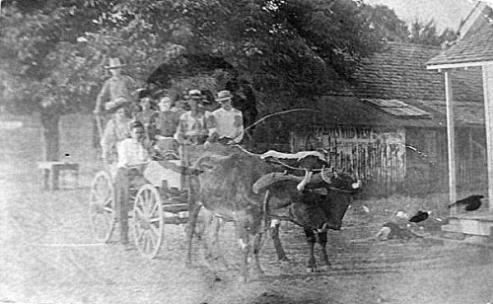 One of my readers familiar with the area wrote that she strongly believes the ox-cart shown in the photo became locally famous as a "tuition payment" to Berry School at Rome, Ga. She said that Berry School has kept a picture of (supposedly) that very ox-cart (and team) which was accepted as full tuition payment from a farmer lad of the area. My understanding is that the school keeps their own photo of it on display as a constant reminder to the public of Martha Berry's charitable and altruistic influence throughout the region. Well-off farmers frequently had no cash, but could pay "in kind". My father also went to Berry School and remembered the Sunday morning marches from the school into Rome for church services, the cheers for "Miss Berry", at ball games, etc. I still have all dad's paperwork from his brief stay there - including the hand-written letter asking him to come back for a second year. Unfortunately, his father died in 1906, and he had to return home to work on the farm. He never got to go back. Founded in 1902, anyone interested in Education in our region, and not already familiar with the school, should read up on the modern Berry College - which humbly started out as, "The Berry School for Boys".